Sr i Sri Sri Tridandi Srimannarayana Ramanuja Jeeyar Swamijiwas a pioneer, inspirer and path maker in the world of spirituality. His greatness lies in his simplicity and his unconditional love for the society. His work is pure reflection of his mind, and his mind followed the path laid down by none other than the divine Sri Bhagawad Ramanujacharya Swami. The whole Universe is supported and permeated by the Supreme Lord. Everything in this universe is part of His divine body. Serving any being becomes His service. Realizing this fact is spirituality. Spirituality teaches us to be selfless and rekindles love in our hearts. This love pushes us to action in serving the society selflessly. With these Mottos ‘Serve All Beings as Service to God’, and ‘Worship your Own Respect All’, Jeeyar Educational Trust (JET) was formed in 1981 by HH Sri Sri Sri Trindandi Srimannarayana Ramanuja Chinna Jeeyar Swamiji. The inspirer of this organization was Sri Pedda Jeeyar Swamiji (1909-1979) who followed the path laid down by a great social reformer Sri Ramanujacharya (1017-1137). The rejuvenating spirit and idealogy of Sri Ramanuja appeared as it was, in the divine form of Acharya H.H Sri Sri Sri Tridandi Srimannarayana Ramanuja Jeeyar Swamiji. HH Pedda Jeeyar Swamiji showed us the direction, as foreseen and propagated by Sri Ramanuja himself, 1000 years back. transforming every single person that came on His way, no matter whether they had belief in God or not. Whenever there is a necessity to uphold ancient Dharmic tradition, the Lord Himself descends or sends His devotees to this world. 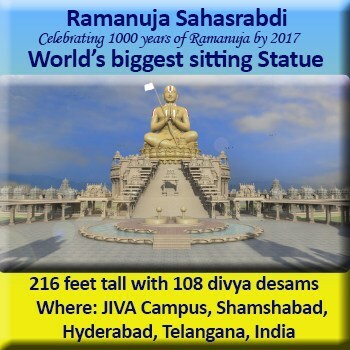 Sri Sri Sri Tridandi Pedda Srimannarayana Jeeyar Swami was one such great devotee who was born in this world to revive Ramanuja’s Vision – Universal Brotherhood and Universal well being. After Manavalamamuni, in the Vedic lineage of Bhagavad Ramanuja, towards the modern era, it is only Sri Pedda Jeeyar Swamiji who strived a lot in spreading the divine messages to the nook and corner of the country. HH conducted a number of Yajnas throughout India for the sake of peace and prosperity to the people in the society. HH Pedda Jeeyar Swamiji exemplified the actual Vedic practices in a sacred manner and reap their benevolences in service to the mankind. Swamiji led many social movements to eliminate superstitions and unauthentic practices that were dominantly prevalent in the society in those days. He is the first one to conduct All India Vedic Conference in the Ramlila Maidan, New Delhi during 1973 in which 4000+ scholars from all over the country and also Nepal have participated. The then Prime Minister, Smt. Indira Gandhi voluntarily attended the congregation, just for a slot of 15 minutes but, spent about 2 hours enjoying the Divine activities, highly praising the wonderful efforts of HH Sri Swamiji in preserving the glory of Vedic traditions and culture. 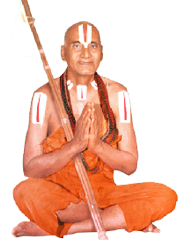 Sri Sri Sri Tridandi Srimannarayana Ramanuja Jeeyar Swamiji was born on Sep 1, 1909 in Kakinanda town of Andhra Pradesh India to the divinely blessed couple Sri Vangipuram Mangayarya and Choodamba. On the very 7th day after birth, a big king cobra was seen spreading its hoods to protect him. This was an extra-ordinary incident to show the divinity of our Swamiji. When mother prayed to Lord, the snake disappeared. Parents named the baby boy “Thiruvengalacharyulu”. Swamiji studied Sanskrit, Tarka, Nyaya and Vedanta at Tuni and various other places. During Swamiji’s tutelage under Sri Rangacharya, H.H came into contact with Sri Gopalacharya Swami and their friendship culminated in a unique association. Both of them studied Sri Bhashya under the guidance of a famous scholar Sri Ramanujacharya of Mandasa, Srikakulam. Later, Sri Srimannarayana learnt Bhagavad Vishaya (Tamil Prabandham) from Sri Gopalacharya, who thus became his Guru. In 1920, young Srimannarayana was very much attracted to the call of Gandhiji and participated very actively in the independence movement of India. In the year 1954, Sri Srimannarayana Swamiji took to Sanyasasrama (monkhood) in the presence of the presiding deity at Thothadri. On June 12, 1954 Swamiji inaugurated Asramam at Badrinath, and consecrated Sri Srinivas Perumal along with Bhudevi, Sridevi, Godadevi, RajyaLakshmi, and Sri Ramanuja on a grand scale.